Each Feather Flag is Made from Polyester, Making the Material Lightweight. The Sign Display is Large Enough to be Seen from Afar. 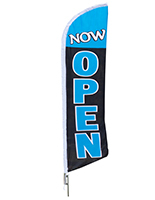 This Feather Flag comes with Lightweight Aluminum Pole. The feather flag can be place into any soft surfaces. The display sign's generic phrase of 'WELCOME' means this graphic can be used to greet guests practically anywhere, such as outside of a bookstore, clothing shop, department store, stylist, or car dealership! 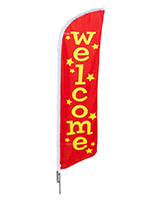 This welcome feather flag that stands 14' tall is viewable from afar. The image imprinted on the canvas has the color scheme of the American flag with stars and stripes! 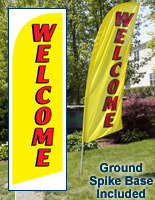 Each welcome feather flag is constructed with lightweight and affordable polyester. The graphic is dyed through so the reverse image is visible on the reverse side. 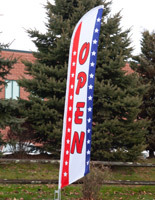 This patriotic feather flag is always readable, as the curved pole keeps the flag extended. The banner sign is therefore easy to read no matter what the weather conditions. 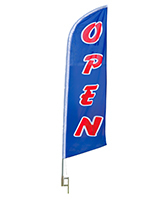 Each feather flag can be used at retail stores. 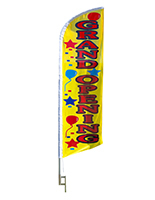 The banner sign's aluminum pole is inexpensive when compared to fiberglass poles. The only real difference between fiberglass and aluminum is that fiberglass is a little more durable, but aluminum sells at a fraction of the cost. 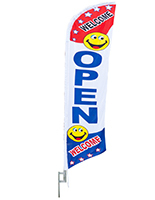 This patriotic feather flag that is equipped with a durable steel spike is engineered for quick set up on grassy areas. 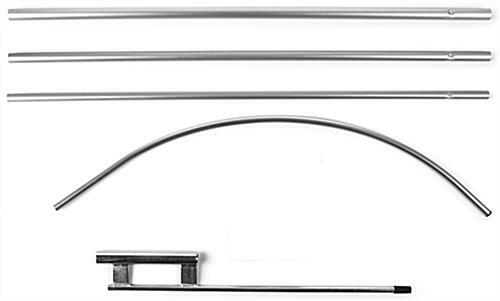 The steel stake can be hammered into the grassy area or other soft ground up to 2'. The welcome feather flag that anchors into the ground with a spike is more stable than banners held in place with a car-foot or cross base. 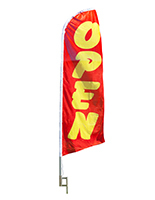 Each banner display can even withstand light to moderate winds! All the user needs for setup is a hammer for the ground spike, everything else is included with this patriotic feather flag.